Written by James Koster on May 2, 2018 Blog. The Products block represents stage one of a project we’re affectionately referring to as “Wootenberg”—the preparation of WooCommerce for the arrival of the Gutenberg editor. If you’ve missed it, Gutenberg is a brand-new, visually-driven content editor being built for WordPress and scheduled for inclusion in the 5.0 release. Read all about it and download the latest version of the Gutenberg feature plugin. What is the Products block? Essentially, the Products block is a modern version of the Products shortcode, built for the Gutenberg world we’re all soon to move in to. The Products block provides an intuitive user interface for inserting products from a variety of sources, then delivers an accurate preview of how that selection will look when published. You’ll also be able to fine-tune the appearance of those products by adjusting the layout and ordering. Or simply add all your products. A dramatic improvement over the existing shortcode experience, don’t you think? We do! Right now, the Products block is a new concept and dependent on Gutenberg. 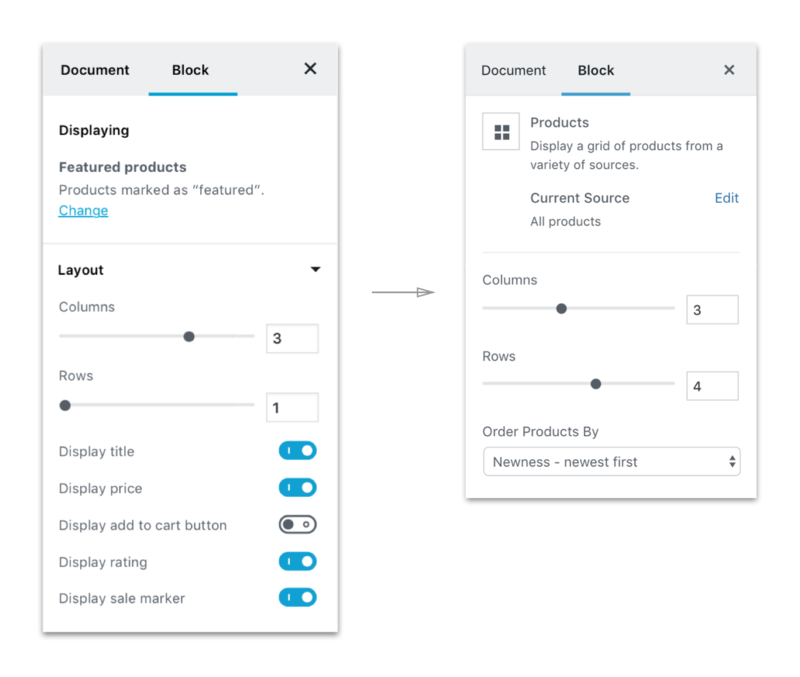 Since Gutenberg itself is still a feature plugin, we’re releasing the Products block as a feature plugin as well. This way, we’re able to build the feature out quickly, independent of WooCommerce core—read more about feature plugins. Best of all, it provides a convenient way for y’all to install and play with it. Note: To start experimenting with the Products block you’ll need both WooCommerce and Gutenberg running on your site. Once we’re happy with the stability of the design and code. we’ll merge the features into WooCommerce core so they’re accessible to all WooCommerce stores. At that point, you can deactivate and remove the feature plugin, and any product blocks you’ve inserted with the feature plugin will remain active. 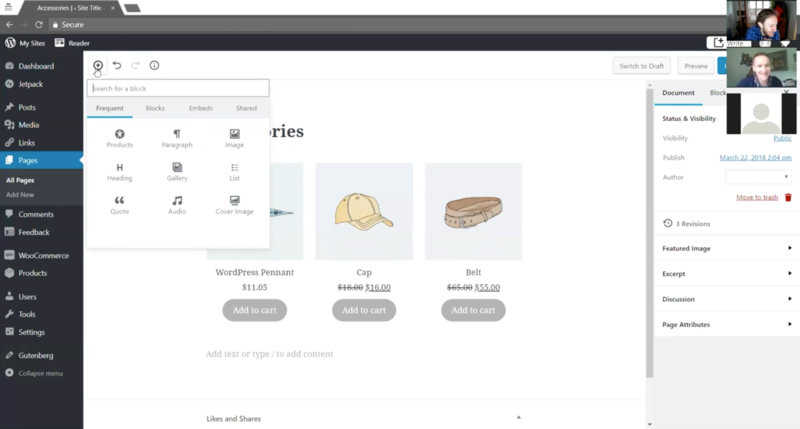 Gutenberg creates lots of exciting possibilities for a large plugin like WooCommerce. For now, it was important to us to limit the scope of our initial exploration to make sure we built a solid foundations with Gutenberg’s design patterns and rapidly evolving codebase, before moving on to more complex tasks like adding a product. As it turns out, even our smaller-scoped project uncovered opportunities we didn’t expect. Before jumping into design, we did a few rounds of research to ensure we were headed in the right direction. This included spending a lot of time playing with Gutenberg, talking with the design team, and looking at what others in the WordPress community are doing with Gutenberg right now. Since we were focused on the products shortcode, we analyzed its usage on 10,000 WooCommerce sites. We learned that the most popular applications of the shortcode are to display specific products, product categories and featured products. Interestingly, very few stores seemed to use it to display top-rated products, bestselling products or products with specific attributes. The most popular applications of the products shortcode were to display specific products, product categories and featured products. It’s fascinating to see how folks are actually using a feature, and this insight was key in helping us figure out which flows are most important. It also challenges our assumptions, so we can make informed decisions on what we tackle in the next design phase. Our first round of designs explored ways store owner might want to display products on a page or post. We interviewed store builders and store owners/managers, created a few test scenarios to embed products, then asked them to try the plugin and talk through their reactions and feedback. Capturing this feedback early in the design process, before starting development, informed the next iteration of designs to better align with how customers expected to insert and display their products. This gave us the confidence to move forward with the first version of the feature plugin for further testing. Our main takeaway from this round of testing was that although our flows were pretty good, folks ran into trouble when it came to interacting with the block settings. This was partly a discoverability issue, but also a result of settings overload. So we removed some options (like product data visibility toggles – something we’ll soon be able to handle better via Gutenberg core) and moved others (like the products scope selector) to the main block settings section, making them visible immediately after the block is inserted. Once the feature plugin was ready and we’d updated our designs, we arranged a second round of usability testing. This time we prepared a live test environment so test participants could interact with the actual Gutenberg interface, rather than prototypes. Watching folks use the actual product was eye-opening — and invaluable. Two of the key lessons were not about the Products block specifically, but about Gutenberg itself. Every single test participant (most of whom had never used Gutenberg before) got stuck when adding a block, and had trouble locating the advanced settings. We shared the results of our tests with the Gutenberg team, a fix has already been deployed for the second issue, and we’re currently exploring design options to address the first. As for the Products block itself, we did some fine-tuning adjustments, like removing an extraneous step when displaying products that do not require further input from the user during selection — if you elect to display featured products, we don’t need an additional action to confirm that like when selecting categories. We also noticed that there wasn’t a consistent flow for changing the scope of products on display and test participants all looked in different places for these settings, so we added more pathways back to the initial block settings. Flat scopes include products sale, or bestsellers – there’s no variance. Varied scopes require further input from the user during the selection process. The result? This feature plugin that’s available to download today. Interested in testing WooCommerce prototypes with us? 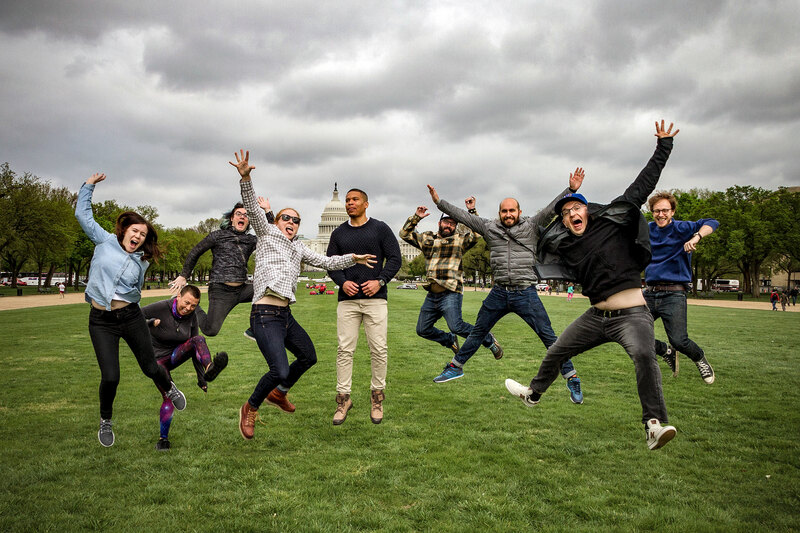 If you’re interested in the very latest WooCommerce developments, please sign up for our Design Feedback Group so you can shape the future of WooCommerce. We periodically reach out to members for help researching new projects and testing our prototypes and MVPs. This is pretty incredible y’all. Excellent job! Look good. Not yet convinced with Gutenberg yet. But once we switch, will surely give “Wootenberg” a try. 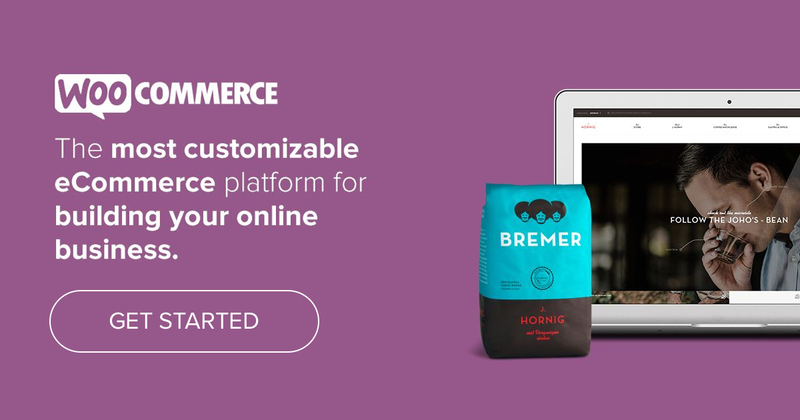 Woocommerce is already complete in itself. Currently building a site for client in WooCommerce. And this Gutenberg thing is kinda scary. Hopefully it will do good then bad for WordPress. Does anyone have idea about the release date of Gutenberg? Is it possible, or will it be possible to drag the products around to change the order in which they are displayed? Hi David, eventually drag/drop will be a feature, but it’s only recently been added to Gutenberg core, so we’re yet to work on our own implementation for the products block. Love to read it. Well Written! Thanks for sharing the information and its makes much easier to place products on particular category ..so easy. Thank you, James. All my issues were resolved it helped me a lot and learned so many things. Great work keeps sharing. yes dear i also agree with you. Nice to visit and see this Blog. I got that this plugin is most beneficial for all the users. I’ve read this article. One of a friend told me about “Gutenberg”. I am thinking for turned for Gutenberg. Firstly I’ve many doubts related to Gutenberg but after reading your article my all doubts has been cleared. Thanks for sharing this worthful information. There are some learning online blogs that worth to spend time and read remarkable learning article. thanks for sharing such a great article to us. Thanks for the update. I was searching for this for a long time. Thanks. Good Peace of information provided by you in this article. A Deep knowledge as well as good content provided by you. Worth Reading This. Excellent post buddy. The timing of your post is superb.So thanks a lot for sharing this excellent post. Thanks for sharing such a useful information, James. Nice Article, thumbs up cheers! article very interesting and helpful. Thank you for sharing your post. Your post very nice and help with us. I am new to this field and now in a learning phase. After studying your tutorial now I am able to add products to posts. Thank you. Thanks for sharing.Very nice site,keep it up..
Mr. James Koaster Your Article “Making it easier to add products to posts and pages with the Products block for Gutenberg” is Superb and very helpful also. Thank-You for sharing this with us. you done great job i really like the way you work with your website. This is my Social media YouTube Marketing Channel. Would you visit my channel? Power BI Training at Analytics Benchmark helps you to Master Power BI Business Intelligence Tool. In this Course, you’ll Master the Development Components like Power BI Desktop, Power Query, M Language, Power Pivot, DAX, Power View and Power Maps. Learn Server Components like Power BI Service, Power BI Report Server, and Power BI Gateways. In addition, learn how to access the Reports and Dashboards using Power BI Mobile Apps. Nice post by you about Gutenberg. Is Gutenberg the right way forward for WordPress? In this post, I takes a look at the Gutenberg editor & its inevitable impact on users. Ecommerce Web Design is really impressive end-product for your customers. So it is important to hire the experts to get brilliant design. The expert’s team has brain-stormed, researched. The experts create a huge number of successful websites that also perfectly suit all kinds of budgets. In general stunning web design features incorporated that supports you to create strong reputation that also offer end-result. Nice Blog you have shared thanks for sharing this useful information. After visiting a lot of website over internet found your’s that content is very interesting for me. Thanks for sharing more about Gutenburg technology on wordpress. I also have a store where we use to provide coupons for various global stores and we add products and deals. Your article is so clear and sorts out my doubt. Your writing skills is very good for easily understand. after reading your article about Gutenberg, I feel it is value for time spent on your website. I’m impressed, I must say nice article.The article is both educative and entertaining, and i frankly say you’ve hit the nail on the head. Exactly, you’re very kind of us about comment!. This help me a lot to learn from your content and give me what I’m looking for…. Amazing tips you have shared. I am sure that these tips will be of great use to the newbie bloggers. If you facing any technical problems to use your roadrunner email account, than you must have to contact our roadrunner technical support helpline number +1-888-338-6033. Thank you for sharing your inspiring success story. Nice to read about your post,I like your writing style. Thanks for this type post…. first-class to study about your put up,i like your writing style. thanks for this kind put up…. Great overview of this topic! Thanks for sharing amazing information! Its a nice and amazing post to read and learn new things about adding up different products. Informative blog..!! Thanks for sharing. Well written informative blog. Good work, Keep writing. Hi, Thanks for sharing the information I hope it makes easier to add products to posts and pages.. This information will really helpful to us. Thanks once again.. Very informative post, thanks you so much for writing this type of useful information. You are doing a good job keep it up Very informative post, thanks you so much for writing this type of useful information.